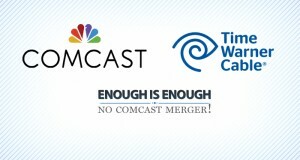 Comcast has made a lot of promises about how its merger with Time Warner Cable will benefit consumers. Unfortunately, it has not always lived up to its promises to regulators and the public in the past. Given this track record, it’s hard to believe that Comcast will deliver all the benefits it is promising if the merger goes through. Comcast has enormous power over a vast network of cable and broadband pipes. It also owns a valuable stream of content from its previous merger with NBCUniversal – including cable channels, news networks, locally owned broadcast stations around the country, and production and content development operations and assets. Comcast has tried to assure the public and regulators that any concerns about this concentration of power were already addressed when the FCC signed off on its 2011 merger. At the time, the FCC required Comcast to adhere to a number of conditions to protect the public from the very real harms that could result from combining the two companies. But as the examples below indicate, Comcast has not always followed through with its commitments. This calls into question whether the company can be trusted to do the right thing for consumers if its merger with Time Warner Cable is approved and it gains even more power in the marketplace. As part of the Comcast-NBCUniversal deal, the FCC required Comcast to actively market and sell reasonably priced stand-alone broadband service to consumers.1 The concern was that Comcast would make broadband available to consumers as part of a bundle only, forcing them to buy expensive cable packages if they wanted to get broadband service. Starter” broadband service as promised.2 After a year-long investigation, the FCC reached an $800,000 settlement with the company because it had failed to mention the service in its mailings to customers, feature it prominently on its website, or offer it at its retail stores as it was required to do for three years.3 Comcast was ordered by the FCC to extend its commitment to offer stand-alone broadband service at a specific price point for one additional year. This condition was meant to protect channels that are not linked to a cable operator. From a consumer perspective, this makes sense. Think about the last time you flipped through television channels and how it impacted what you ultimately decided to watch. Flipping through a group of news and business channels that excludes content from a competitor could seriously impact the likelihood that a consumer will come across that content. In fact, that’s exactly what happened in 2011 when Comcast gave its own news networks MSNBC and CNBC preferential treatment over Bloomberg.5 While Comcast placed its own news networks in the proper neighborhoods in both its standard definition and high definition offerings, it failed to carry Bloomberg adjacent to its other SD news channels.6 In 2012, the FCC ordered Comcast to carry Bloomberg near its other news channels in all of its offerings,7 but the episode offers another example of why regulators and the public should be wary of any promises that Comcast makes. Comcast has promised regulators and the public that it will not behave in a way that harms competing online video distributors.8 However, it has a history of discriminating against online video services which have threatened Comcast’s traditional subscription model. and video game consoles. These devices connect to the Internet and allow consumers to download apps for online video services. Comcast, for example, has its own Xfinity app that delivers video over the Internet. In the past, it has favored its own app over other companies’ apps through the use of data caps. In the past, Comcast has experimented with imposing data caps on its residential video customers9 and has punished consumers for going over these caps by either expelling them from the network or charging them extra for exceeding their monthly limit.10 At the same time, it has exempted its own services from these caps. Data caps that apply only to video services that compete with Comcast are clearly discriminatory. This is exactly the type of behavior that regulators were worried about during the debate over the ComcastNBC merger. The dispute between Project Concord and Comcast is currently before the FCC.16 Project Concord maintains that Comcast – a company with access to valuable content – is reluctant to make its “must-see” programming available to online distributors – even though it’s required to under the Comcast-NBCU deal.17 According to Project Concord, NBCU is fighting its obligations at every possible turn, using its massive resources and power to engage in a lengthy and costly proceeding that “only a multi-billion dollar conglomerate can afford to mount.”18 The result has been stalled negotiations and refusals to move forward until the company agrees to the terms and rates demanded by Comcast. We’re concerned that companies like Project Concord will be forced to accept whatever terms and conditions are set by Comcast or be left in the dust without access to Comcast’s customers. Comcast will continue to treat other online distributors similarly – either by locking down its valuable content from others or acting in a way that prevents online distributors from competing with it.